When my friend Carrie requested some dog-walking mitts to match a hat I made her, she mentioned that she sometimes needed her fingers. I made this mitt as a compromise between fingerless mitts and full mittens. Cute and fancy, but also practical. Needles: size 7 US (4.5 mm) double-pointed needles or a long circular for magic loop, or whatever size you need to get gauge. 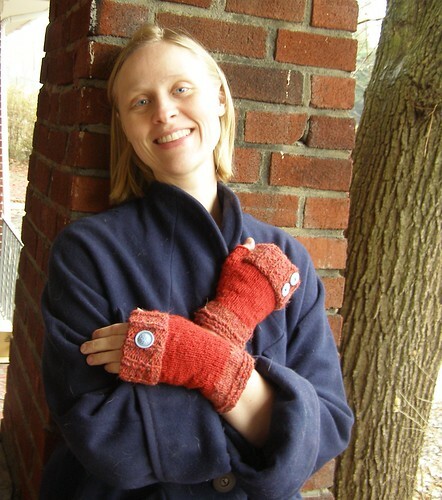 This entry was posted in cosyknitsliterally, knitting, mittens, patterns by cosymakes. Bookmark the permalink. Brilliant! I need to whip some copycats up right away to use whilst reading and waiting for the El. Nothing is worse than trying to turn a book page in mittens… Happy almost Spring! Wow,those are great. Much better than pulling your sleeves down over your fingers like I do, I really need to make a pair of those. love them. seriously:: head-over-heels. brilliant! I just found this place, and it looks really good so far. Looks like a place I can spend alot of time at. thanks for the nice compliment :) and nice to meet you! Oooo! 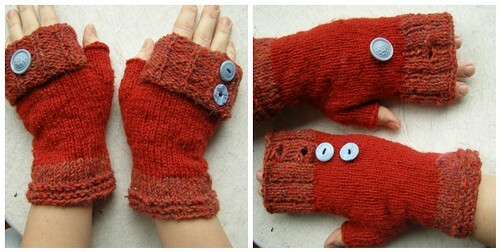 I absolutely adore these button back mitts (I love a good mitt in general!). Problem is I don’t knit, Cosy! I may need to learn just for these!